Kickstarter Campaign Underway for Grant Circle Little Free Library | Park View, D.C.
Little Free Libraries are gaining in popularity around the area, and I personally really like the idea. Recently, one was added to the community garden at the former Bruce-Monroe school site. I’ve recently learned that there is another one being planned for the Grant Circle area. However, for the Grant Circle library to be constructed and installed, the sponsor needs funds. The organizer of the Grant Circle Little Free Library has initiated a Kickstarter campaign to raise the funds necessary to make this library a reality. They are seeking a total of $500 before Wednesday, September 10th. This seems like a very achievable goal. The first time I saw a little free library in Washington, DC I was in love with the idea. I love that the little free library promotes reading books (not a kindle, even though I do read one sometimes) and creates a sense of a shared resource within a community. My family and I moved to Petworth just a few months ago and would love to bring this little free library to our new neighborhood. The free library will be located on our front lawn at our home near Grant Circle. I will maintain the free library and hope that it will be filled with books for both adults and children. I think this will be a fun way to introduce books to my 1 year old daughter (and hopefully the same will be true for other kids in the neighborhood as well). 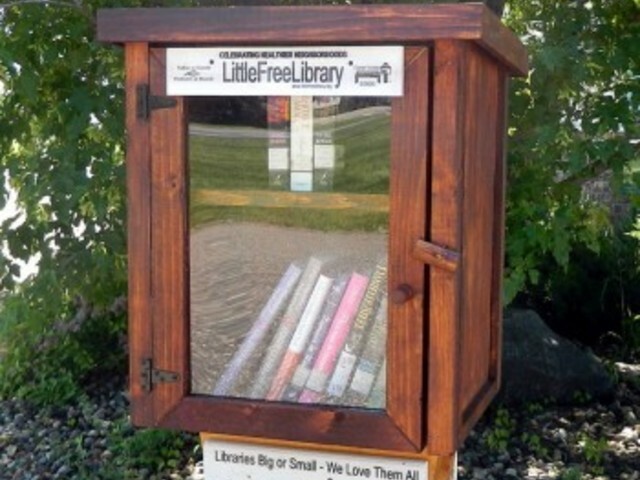 The little free library will look very much like the one shown in the picture above. Costs: The funds raised will be used for the purchase and installation of the library itself. Any additional funds raised will go towards keeping the library stocked with books and for any maintenance needed to keep the library in shape. This entry was posted on August 29, 2014 at 7:01 am and is filed under Fundraisers. You can subscribe via RSS 2.0 feed to this post's comments.